Bradford County Commissioner Doug McLinko addresses the Wysox Township supervisors prior to their vote to support a new Bradford County tourism agency that might operate separately from the Endless Mountains Visitors Bureau. 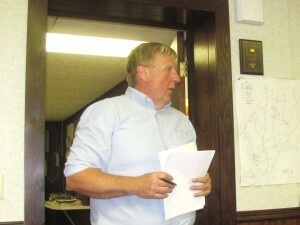 An ambitious agenda for the monthly meeting of Wysox Township Supervisors on Tuesday evening broached a wide array of topics, ranging from detailed reports of subsiding country roads seriously in need of repair, a concerted effort to acquire a new heavy-duty truck before winter, a request to drop the speed limit on Route 6 to 25 mph, and a proposal to follow the Bradford County Commissioners on their quest to set themselves apart from the Endless Mountains Visitors Bureau (EMVB). Commissioner Doug McLinko addressed his hometown colleagues as a follow-up to a letter sent to all 51 Bradford County municipalities about two weeks ago. 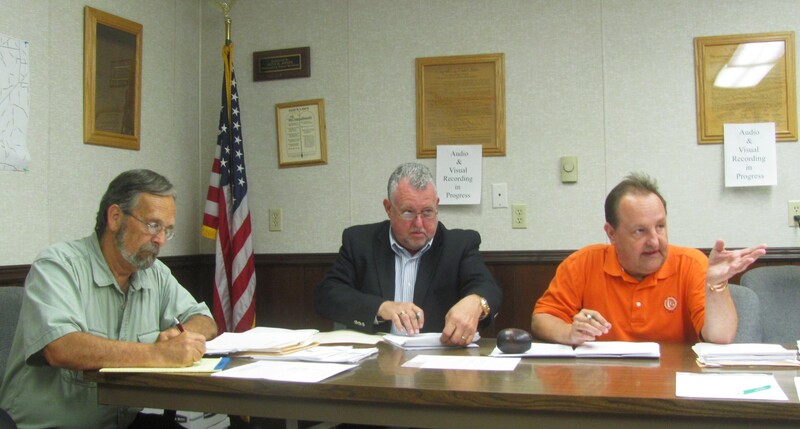 The letter was only signed by McLinko and fellow commissioner Daryl Miller, but McLinko told those in attendance at the Wysox Township meeting that all three commissioners were in agreement. He said that Commissioner Mark Smith did not sign the letter because Smith was out of town. In February, Smith described the proposal as “an ill-advised decision.” He related Tuesday evening that he talked to Wysox Township Supervisor Bill Them and that Them expressed his concern about the lack of a concrete plan. At the meeting, Them conceded that he was also concerned that the county would have to hire a team to bring the commissioners’ pan to fruition. After McLinko assured the board that there would only be one new employee, that a plan would be unveiled as soon as municipalities representing 51 percent of the county’s population had approved the measure, and that EMVB would not dissolve as a result of the county’s succession, the two supervisors present, Them and Jon Kulick, voted to support the proposal. Contrary to EMVB’s stated mission of promoting the Endless Mountains region to potential visitors from other states and parts of Pennsylvania, McLinko maintains that Bradford County’s portion of the Room Tax Fund should be used to promote both tourism and business development. “You have to link the two of them together,” he remarked. McLinko suggested that, in the course of their new plan, the commissioners have united the five chambers of commerce in the county and that he fully expects to eclipse the 51 percent threshold in the near future. Among the “misinformation” in the media that McLinko has cited repeatedly is that funding to organizations and event coordinators currently on EMVB’s radar will cease. McLinko said that the enthusiasm among the five chambers, heritage groups, and museums has been high and that their representatives will be drawn back into the planning process after the commissioners have won enough votes to proceed. Kulick was quick to throw his support behind McLinko, and Them seconded the motion, relating that McLinko had satisfactorily answered his questions. 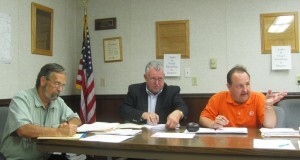 Wysox Township Supervisor Jon Kulick (above, right) responds to a participant in the Aug. 12 meeting of the Wysox Township Supervisors.